Carbon dioxide is a major cause of global warming. In order to control atmospheric carbon dioxide concentration, many countries are actively investigating effective ways to transform carbon dioxide into chemical fuels such as methane, ethane and methanol. In particular, a high-efficiency photocatalyst is essential to prevent the generation of secondary harmful substances when converting carbon dioxide into chemical fuels. DGIST's joint research team has developed a new titania photocatalyst that converts carbon dioxide into methane three times more efficiently than the existing photocatalyst by manipulating its surface. The research team has applied a simple magnesiothermic reduction method to synthesize oxygen-deficient titanium dioxide by removing oxygen atoms on the surface of titanium dioxide, producing a highly efficient photocatalyst that can convert carbon dioxide into methane. The research team emphasizes the newly developed photocatalyst's controlled band gap, achieved by removing oxygen atoms on the surface of titanium dioxide through strong reduction of magnesium and hydrogen. This band gap control improves the light absorption and optimizes the efficient charge separation. As a result, the photocatalyst increases the conversion rate of carbon dioxide into methane up to threefold compared to the existing photocatalyst. 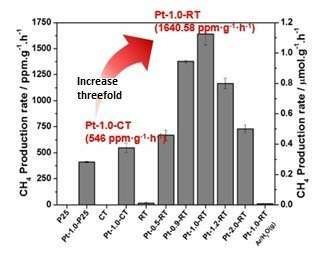 In addition, the reduced titanium dioxide photocatalyst is superior to the existing titanium dioxide in terms of the conversion efficiency of carbon dioxide into methane. It also highlights the excellence of the current magnesiothermic reduction method, which was applied through a relatively simple thermoreduction method with Mg metal and hydrogen gas.